At this stage of the game I am fairly confident our area will be impacted by our 4th major storm of this month next week. There are unknowns - availability of cold air to the coast, timing, duration, etc - but those will be resolved over the weekend. 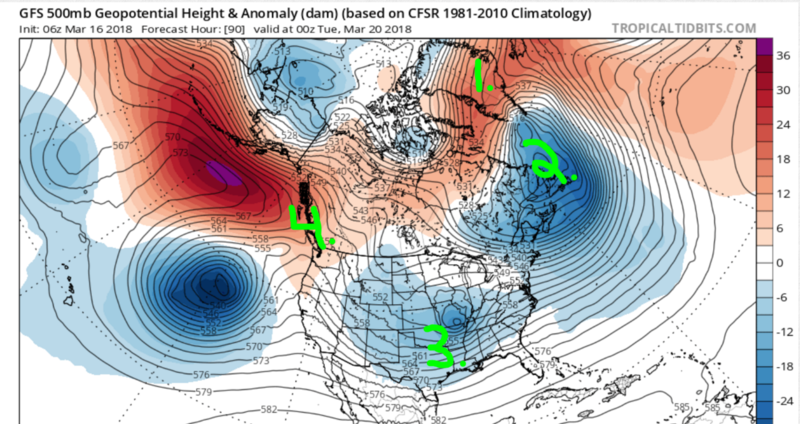 The purpose of this post will be to examine the pieces and show why we're seeing differences run to run on the models. I labeled 4 elements on this 500mb anomaly map valid for Monday night. 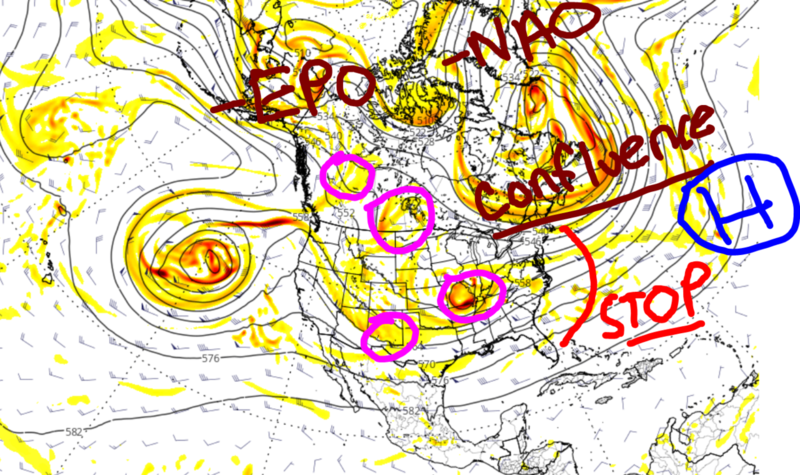 The 06z GFS shows a stronger -NAO over Greenland and a more expansive -EPO/+PNA in the western U.S. The confluence area is about the same, more consolidations on the 06z GFS, and the trough is also stronger and more consolidated on the 06z GFS compared to 00z. The biggest takeaway? Models are not done trending with these upper air features. This is the type of system where one small change in the upper atmosphere will create a new solution at the surface on the models. Let's take a peak at what the upper energy tries to do. The fuchsia circles are key pieces of upper energy critical to the evolution of our storm system. The eastern-most circle is a closed 500mb vort that is responsible for developing a primary low pressure near Oklahoma. This low tracks almost due east, and because of strong temperature and pressure gradients across the north there is a large swath of precipitation that develops in the Midwest that tracks east towards us. Earlier this week we saw some models cut this primary low west near Ohio, but because of the blocking to the north (HP but also a press from the -EPO) models have given up on that solution for the time being. They key is not so much the surface low but the closed 500mb vort. Where does it track and how strong does it get? The 00z GFS showed a weaker 500mb vort so heights along the east coast, coupled with the confluence to the north, remained dampened which kept enough cold air in place for precip to fall in the form of snow. The 06z GFS showed a stronger vort so heights were higher which lead to rising temps and more rain/mix along the coast. What ends up happening, in my depiction of this whole thing, is the initial 500mb vort breaks apart near the east coast once it "feels" all this blocking in the Atlantic. The 1st half of this system comes from that 500mb vort that broke off the bowling ball upper low in the eastern Pacific. Then we have all these other upper level vorts (the other 3 fuchsia color circles) that are phasing into the trough and creating a brand new 500mb closed low somewhere along the east coast. Where this "2nd" closed low develops will ultimately determine which areas see the greatest amount of snowfall. It is possible some areas see rain/mix from the 1st half of this storm, then depending on where the new 500mb vort forms, see snow the 2nd half. OR some area could stay ALL SNOW for the 1st and 2nd half of this entire event - which is modeled to be greater than 24 hours long. It is also possible models slow everything down and all these energies consolidate to form just 1 storm. That would eliminate the 2-part storm idea and likely cut down on duration too. Whatever the case, a very complex storm to forecast and I think someone - as far south as DC to Bawston - could see Godzilla (12"+) or even Roidzilla (24"+) snowfall amounts depending on which scenario comes to fruition. My gut feeling is telling me DC and the Mid-Atlantic is too far south to get into high snow accumulations. I think interior sections, from south-central PA to NEPA, NW NJ, into CT are in a very good spot. The coast, such as Philly to NYC, are on that line. I think these are the cities that could benefit from the "new" closed 500mb vort that develops. These cities could start as rain (from the initial closed 500mb low that raises heights too much) then change to snow later Tuesday or Wednesday. Again, nothing is set in stone but I am just spit balling some realistic scenarios given the time of year. Deep Thunder model nicely depicts some of the features I spoke about in my post with the dual low's. Frank, EXCELLENT, and thank you for this great analysis.Lot's to watch for sure, really many pieces in this one. For SNJ and the coastal plain possibly but please lets not get into OP runs warm, rain etc. They are just guidance and not the solutions at this point. The op models are going to waffle and won't be able to decipher the temps/thermal profiles at this range overall. Climo will be the norm at this range for model depiction as you can see in the deep thunder run. Does the coast or in my case just inlsnd stand a chance at doing well let's say 6 to 12 if not a Godzilla or more? Yes I read ur write-up but was a bit unclear as to how u felt ATM for this area. I don't want get too excited for nothing again. Also will winds be big with this sorry I know but I gotta ask. Also frank so you are buying the double lp now? A day ago u said it was bs. Just clarifying. That b incredible and give a shot at first drawing in cold air for coast and 2nd to deluver? Good sign that the primary low is dying in the West VA area. Good indicator that the cold air is strong enough to fend off warm air intrusions. Good signs! Great write up BTW Frank. This really is such an interesting set up. Im pretty sure nothing we have seen so far is even close to the final soln. There is alot of vorticity to sort out. We def still most likely have some kind of Miller B type transfer to the coast, but how far it can cut north and west is really looking limited due to the synoptic set up. However, I would not be surprised to see a second wave of energy end up becoming more dominant than the original transferred energy and ends up affecting us for wed to thurs. NOt sold on that yet however. Bottom line we still need to be patient. This set up looks entirely unique to anything we've seen this winter. Frank, as usual, very well done!!! I'd love to add and comment but I have nothing else to add or comment lol the thoughts and reasoning I set forth about this system several days ago remain unchanged with system, as we are seeing the modeling go toward them (for now). While as happy as I am that is the case, I also feel saddened by the fact that I cannot add anything. 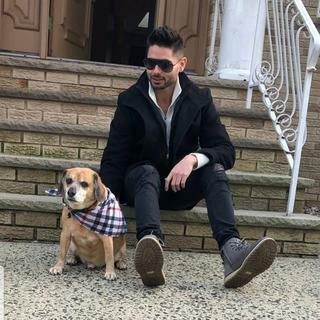 So, I have decided to join mugs' team and become a temporary hype-man along with him. As a direct consequence: FIRED. UP. rb924119 wrote: Frank, as usual, very well done!!! I'd love to add and comment but I have nothing else to add or comment lol the thoughts and reasoning I set forth about this system several days ago remain unchanged with system, as we are seeing the modeling go toward them (for now). While as happy as I am that is the case, I also feel saddened by the fact that I cannot add anything. So, I have decided to join mugs' team and become a temporary hype-man along with him. As a direct consequence: FIRED. UP. Thanks for the write-ups!! No matter what happens, I am beginning to appreciate the uniqueness of the storm. Gonna have to reread everything. RB, if you do become the hype man, please make sure you have the appropriate misspellings!!! "THIS really tells the tale as to how close we really are to something historic (*per the GFS Op*). Those d-prog/dT trends are incredible. If you back the flow any more along the East Coast, which I've been of this opinion for a while now, as I think is going to end up occurring, you are really going to just unleash an incredible deformation band on the northern and western sides of mid-level lows. With the highly anomalous p-wat component coupled with the auspicious Synoptics, you are looking at dropping feet of snow over a very large swath of pretty populated real estate, even if it avoids the I-95 itself. Absolutely incredible. The historic reference was only with respect to the GFS Op; I don't want to mislead anybody. However, the part about seeing the further backing of flow along the East Coast is something I have believed for several days. I think modeling is currently still underestimating some of the height rises ahead of the whole thing, which would increase the southerly and even easterly component (to a degree) and bring the low further north before heading east- northeast. I like the idea of a tighter low closer to the coast. Always have." "Gefs has the same thing trough deeper and sharper I get we are still all being quite cautious due to lead time still far out but the ceiling is unreal"
amazing Al we the jackpot 18 + don't buy it yet. But it has been colder. Go hard, or go home. HOLY CHRISTMAS THE ENSEMBLES OF BOTH GFS AND CMC ARE I.N.S.A.N.E.!!!!!!! SYO I LOVE I CHRISTMAS '02 REFERENCE AS THAT IS MY TOP ANALOG FOR THIS STORM!!!! ENSEMBLES LIKE IT TOO!!!! A lot of very exciting talk on here from some really very intelligent people. Has me excited - but as always keeping expectations in check until about 48 hours out. JESUS H LOOK AT THIS GEFS!!!!!!!! amugs wrote: JESUS H LOOK AT THIS GEFS!!!!!!! !